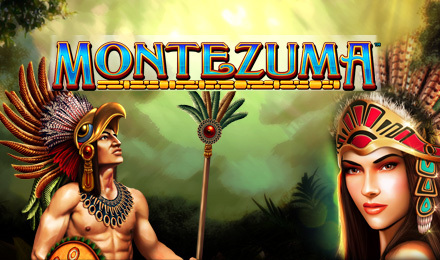 Uncover the hidden treasures of the ancient S. American Aztec culture with Montezuma Video Slots! The golden reels are filled with warriors, ancient wilds, scatters, FREE spins, a Wheel bonus and a bonus guarantee to help multiply your riches! Discover rich treasures and explore the ancient South American Aztec culture with Montezuma Video Slots at Vegas Spins. Created by WMS, this 5-reel and 30 payline slot game explores this ancient civilization and the legendary warrior and Emperor Montezuma. Set deep in the ancient jungle, the intricate gold reels are filled with rich Aztec symbols like warriors, princesses, eagles, gold masks, feather Caps and dream catchers. While you hunt for treasure, watch out for the wilds and scatters that can lead you to the FREE spins feature and Wheel of Fortune game to uncover FREE spins and multiply your wins. The rich reels also offer a bonus guarantee feature, to ensure you receive a minimum of 300 times your line bet during the free spins feature. So make sure you join the adventure to discover its hidden treasures and multiply your riches!